Organic compounds containing amino groups are at the center of modern organic chemistry, and are widely used in the pharmaceutical industry, crop protection, natural product chemistry, and in advanced materials. Modern methods for the introduction of the amino group are therefore of major importance to synthetic chemists and product developers. Over the last decade, many methods have been developed to generate new C-N bonds. At the same time, the pharmaceutical and chemical industry was rapidly moving away from the development of racemic compounds to the direct synthesis of enantiomerically pure materials. 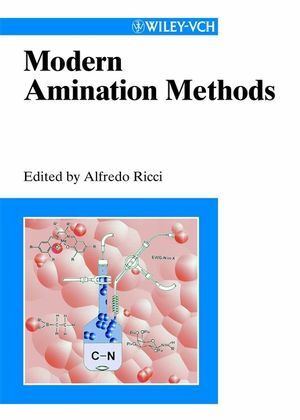 The articles of this book, written by internationally recognized experts, thus focus on asymmetric synthesis. The most recent catalytic amination methods have particularly revolutionized the chemistry of amino compounds - and you find them all in this first comprehensive overview. Alfredo Ricci is full professor in Organic Chemistry at the Chemistry Department of the Faculty of Industrial Chemistry. He was appointed in Florence where he spent part of his career covering for many years the roles of Department head and Director of the National Research Council. 1990 he moved to the University of Bologna. Professor Ricci has authored more than 250 scientific publications and received several scientific awards, including the 2000 French-Italian Prize for Synthetic Organic Chemistry and in 2005 the "A. Mangini" Gold Medal. Since 1995 he is member of the 'Honorary Advisory Board' of Synlett and in 2000 served as editor of the Wiley-VCH book "Modern Amination Methods". "...the reviews are of a uniformly high standard and the book amply succeeds in its aim of providing a valuable overview of the field that can be recommended to all synthetic chemists." Organic Process Research and Development Jnl.